Not many of us still use toothpick to remove detritus from the teeth but his tiny pointed stick is still useful for picking up small appetizers (like cheese cubes or olives). To have an easy access to those useful stick, we need a proper holder or dispenser. Unless you are extremely selective on what kinds of toothpick holders to have in the house, it may not be a big issue which design you choose to purchase. But have a unique toothpick holder will definitely win you some applause during a party. 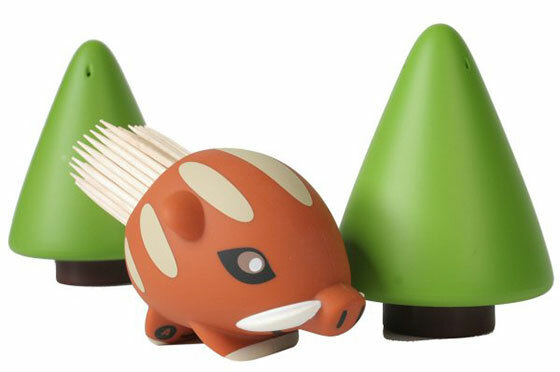 Take a look at the 9 Cool and Unusual Toothpick Holders we prepared for you. 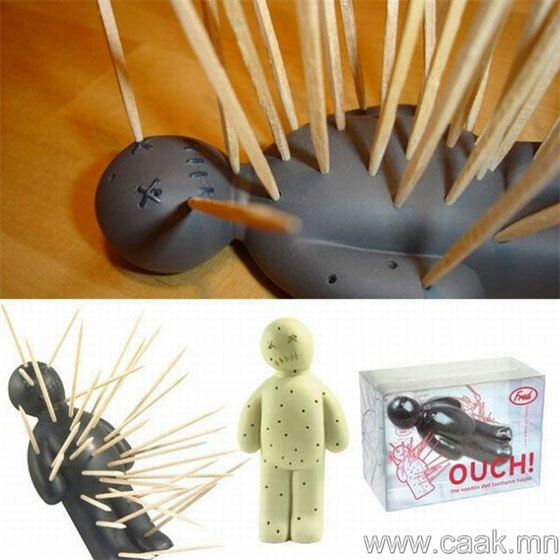 Now you can not only make your toothpick easy access but also attractive. 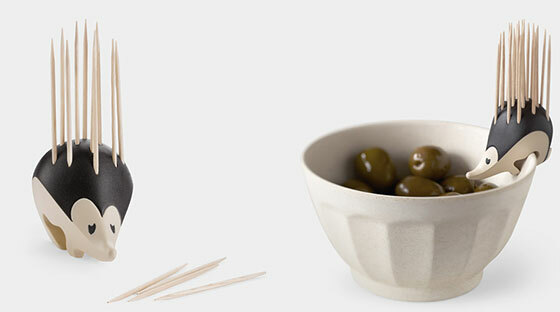 Display toothpicks in this charming hedgehog-shaped holder when serving cocktails or hors d’ oeuvres. It rests on the table or conveniently hangs on the edge of a bowl. Comes with 22 picks. Hand-wash only. The salt and pepper trees also stick to their place on the plate with the help of little magnets.In this case it is a toothpick-holder-pig. You can find him standing under two green fir trees. He loves to hang around there. Because of a little magnet under his feet he always finds his way back to the trees on the green plate, which is included in the set. You can fill them easily from the bottom. This piece is a more versatile piece that can double as a toothpick stand as well as a shot glass holder. SHOT GLASS IS INCLUDED! :) This stand makes an excellent display for the kitchen counter, table top, bar, restaurant front. 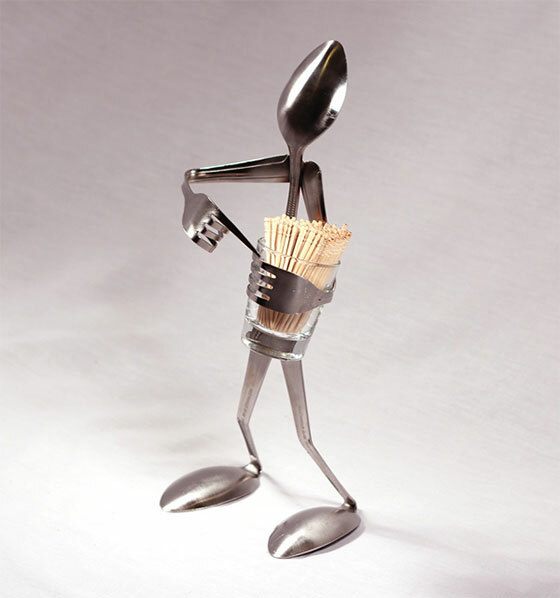 It is 100% stainless steel so it will not rust and it will surely get laughs every time! 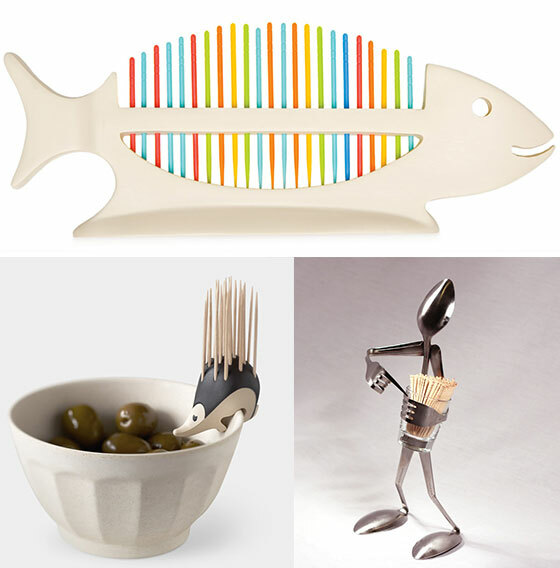 Bring a little life to your kitchen with this Picky Boy toothpick holder from Qualy! 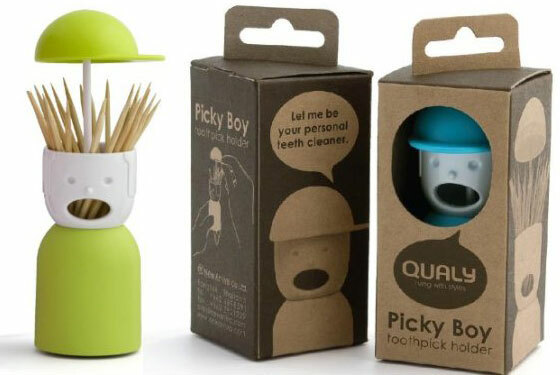 Picky Boy has been designed to help keep your toothpicks nice and organized. When you need to grab a pick simply lift up his hat, and up the toothpicks will pop. This fun novelty kitchen product is sure to be a hit with all your guests. . All Qualy products and packaging are 100% recyclable. 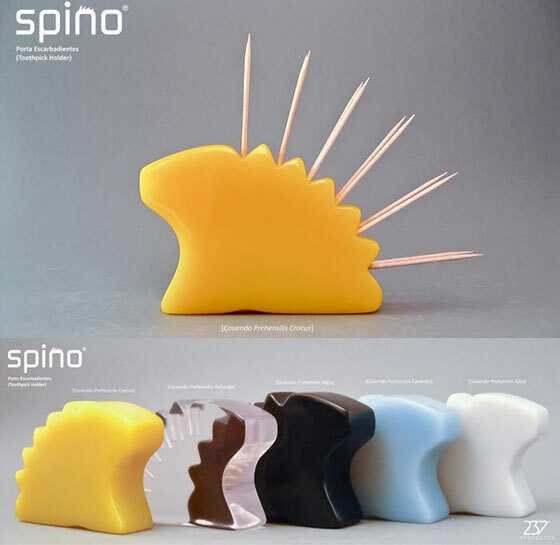 Spino” toothpick Holder and napkin holder takes its shape from the porcupine. 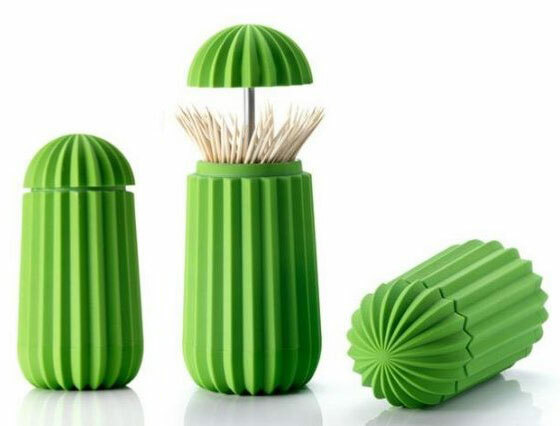 This unique toothpick holder as well as napkin holder was designed taking not only the physical aspects, but also the substance, the essence and the sympathy from these animals. This holder is quite stylish and will enhance the show of you table. Cheese cubes, fruit chunks and meatballs beware! These toothpicks are coming to get you. This white fish sculpture made of resin holds a rainbow of reusable corn toothpicks that can be used to add a little life to party after party.